← Packing up, breaking camp, moving on to our next boondock! Thousands of acres and they’re all mine! It would seem that way. 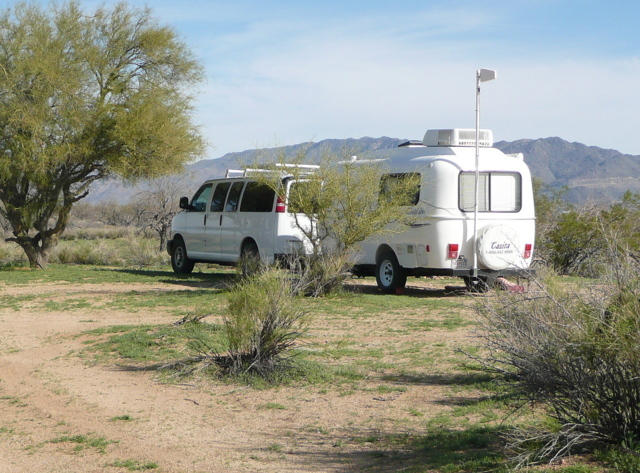 The crew and I are camped in the same spot as last year on BLM public land between Wickenburg and Congress, Arizona. The photo above shows our front yard. Our timing is perfect. As we arrive at the cattle grate and gate at the entrance, two RVs are leaving. Now it’s just us! I position the Best Little Trailer in the same campsite we had before. It’s much greener this year. Fresh grass grows all over. I pick up the ammo shells lying around and the cans with bullet holes in them. I put the Best Little Trailer in order, including the hoisting of the antenna, and then I relax with the crew for the rest of the day. Bridget and Spike amuse themselves as they get reacquainted with the campsite. I want to find the herd of horses. This morning the crew and I walk to the watering trough. On the way I scan the sandy ground in search of hoof prints. Nothing but jackrabbit prints. The watering trough, though full, is not dripping fresh water. Around the trough are horse droppings; none of it is fresh. It’s apparent the cattle have been removed and the horses don’t frequent this trough often. We walk the lane that leads to another watering place. On the way I see hoof prints on the sandy road which gives me hope. On second thought I realize the prints are probably from a horse being ridden. Horses don’t graze in the road! Spike and Bridget hurry ahead, climb the man-made berm, and discover the pond is dry. It’s a beautiful morning with lots of birds singing. I find a few yellow flowers. Bridget and Spike happily trot on the soft sand, a welcome change from the rocky ground of our recent camps. We take a turn for home. 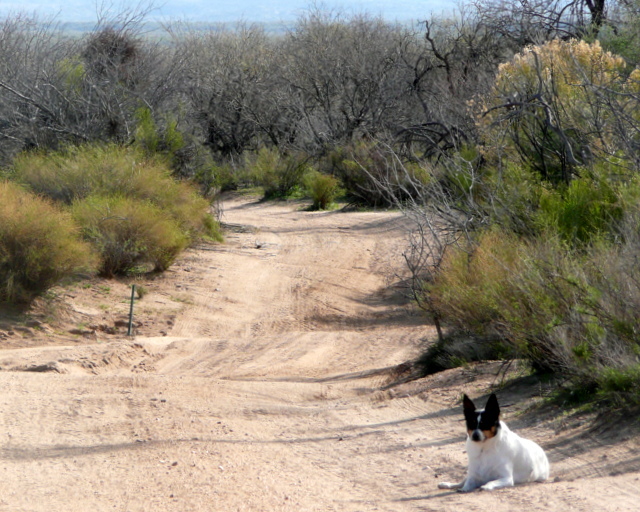 Bridget runs ahead and lies down waiting for Spike and me to catch up. Well, darn. No sign of the herd of horses. And they aren’t likely to show up in this area without fresh water to draw them here. Later I dig around in the back of the PTV. I pull out our folding grill and bag of briquets and set up a cooking station in the shade of the palo verde at our campsite. It’s the hottest part of the day — around 90 degrees I estimate — but it’s cool in the shade. There’s even a breeze. I place five chicken breasts on the grill. I can count on Spike to keep a careful watch on the grilling. As soon as a chicken breast is ready, I cut it up and Bridget, Spike, and I feast together. Toward the end of the day, the crew and I resume our horse hunt. 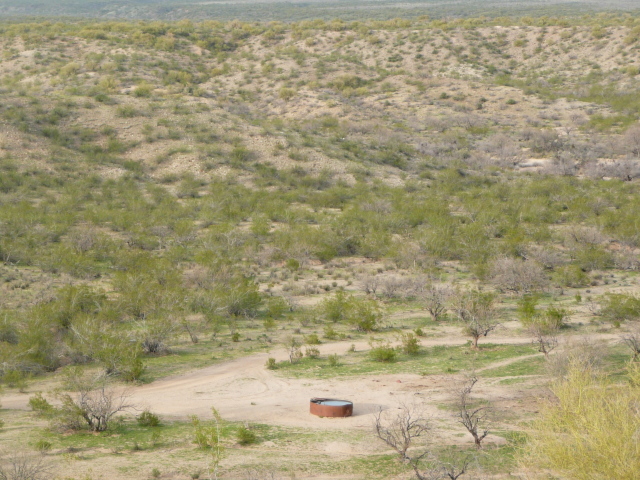 Our destination is another watering trough that can be viewed from an overlook. I survey the wide valley, the washes and gulches, the slopes of ravines, and the ridge far off to the east. No movement at all. 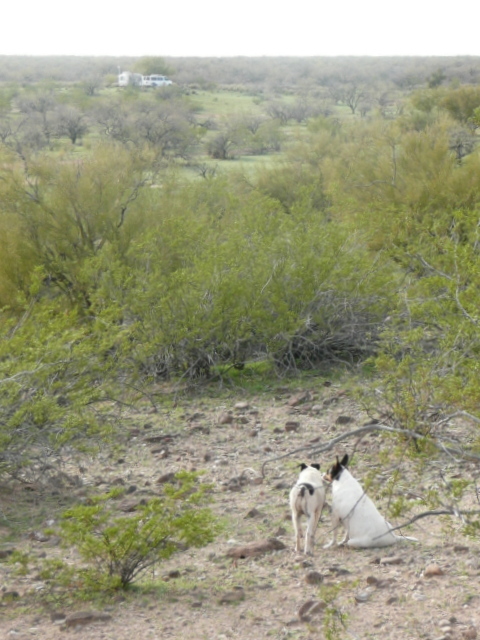 Up on this hill, a slight updraft blows through the palo verde. It’s rocky up here. Bridget takes off down the slope on a different path than how we came. There’s that homing instinct again. Spike and I follow. Of course, when I try to take a picture, Bridget sits down. See our camp in the distance? Look at all that green grass! 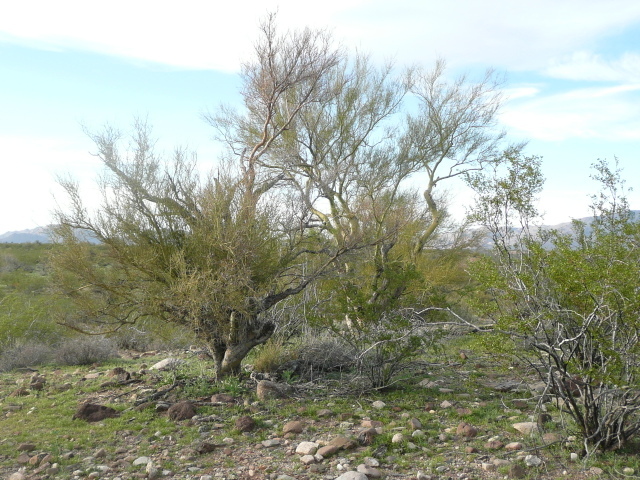 The mesquite trees are grey with very few leaves. As I write this blog post, Spike is lying in the dirt outside our door. Jackrabbits frolic on our lawn with no apparent worry. It’s jackrabbit paradise out there. Well, Spike is keeping an eye on them. However, it would never occur to him that, since he’s a dog and they’re rabbits, perhaps he should chase them. No. Spike has a live-and-let-live attitude. That’s one of the things I love about him. Bridget has absolutely no interest in wildlife. Not even as a spectator. 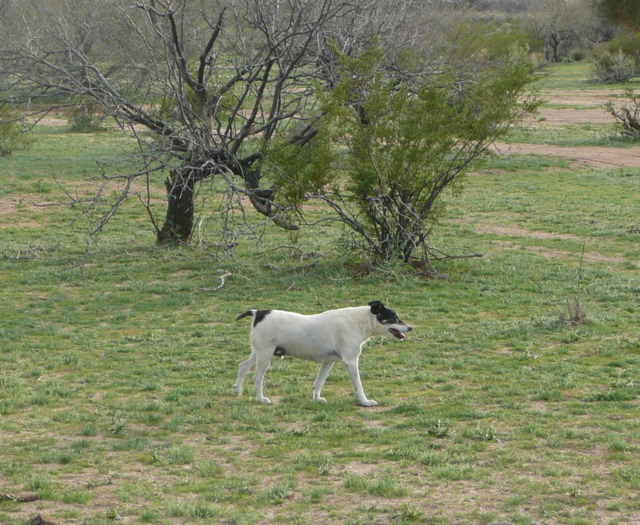 She doesn’t care about jackrabbits. She’d rather be inside, lying on the bed, close to me as I blog away. Note: Five steady bars for internet and several television channels! 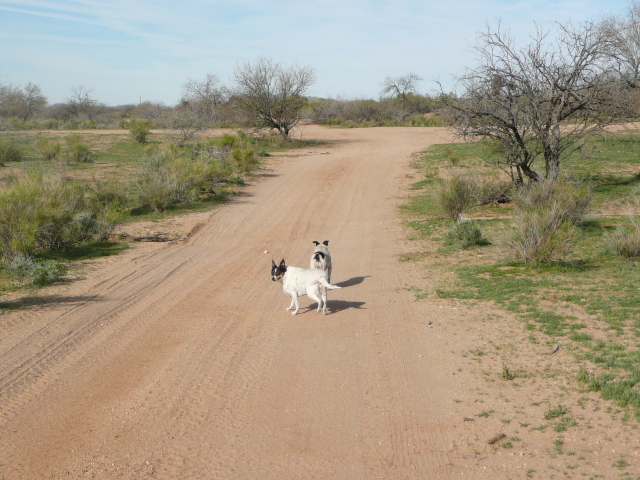 This entry was posted in Simple living and tagged BLM, camping, casita, Congress, desert, horses, palo verde, rat terriers, Southwest, Tow vehicle, Wickenburg. Bookmark the permalink. I sure hope the horses show up and you are able to get lot’s of great pictures. I’ll be watching!! Thanks for sharing, the green grass looks great! You’re welcome, Janet. Last time we were here, right when I gave up looking for the horses, they appeared at our campsite. Love the new campsite. Years ago my husband put a mine claim in Yarnell, AZ. We’d pack a picnic lunch or take a grill & camp out there for a day or two. The kids were little then and they loved it as well as our little dog Muffin. We’d pan for gold and actually gather quite a bit over a year and sold it later at the going rate. It was fun while it lasted. What a gorgeous new camp. I wouldn’t have seen it from last year as I am still reading in 2011! Trying to read all your blog 🙂 Hope you find the horses again this time. I am away for the next 3 weeks, so will miss reading your daily blog………….so will be catching up on that as soon as I return. We are off to Vietnam and Cambodia…………our very own adventure. Stay safe and well until I return dear Sue and the crew!! Well, bless your heart, Glenda, reading my blog from the beginning. Wow! Quite an adventure for you. Have a great time! Isn’t the green desert beautiful!!!!!!!! Makes you like all the rain we had this winter. Enjoy your new home. Hi, Pat. . . After a camp of brown and tan since leaving Ajo, it’s good to be back in the green. Look at Spike watch that chicken; bet he is glad he didn’t run away after all. 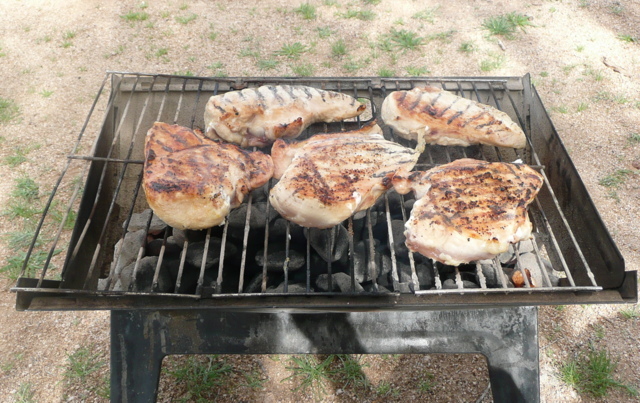 We had our first barbecue of the year here on the Cumberland Plateau with chicken thighs. It just hit 70 today. Your first barbeque of the season . . . how nice, Mick. I’m back to plain ol’ chicken. Have to keep the weight off. How far away from the town of Congress are you? If you go North through town heading towards the big mine there is a old cemetary out there off to the right of the road. In 2009 I saw two Gila Monsters and a Pole Cat a stones throw away from the cemetary. 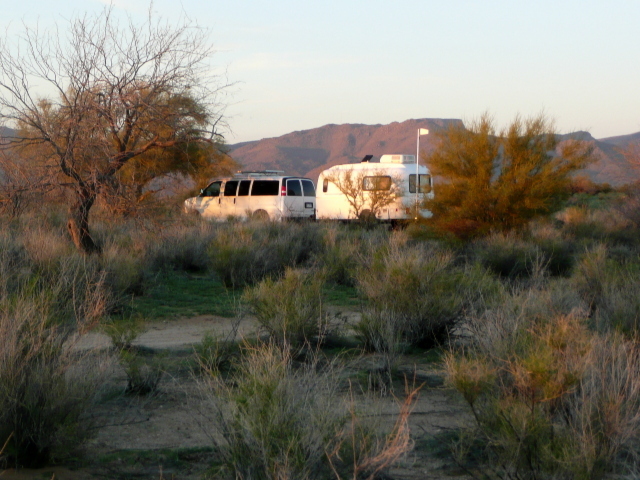 You can camp in this area as it is BLM land I think, as I saw other RV’s in this area. Part of this area is a dumping ground for the locals, so camp away from the junk and broken glass. No Trespassing signs are posted at the mine. You might want to explore this area but not camp. Your area now looks much nicer. Hi Joe! I camped in that very spot last year. I was there for a few days and then Al and Kelly (Travel with the Bayfield Bunch) invited me to come over to this BLM area to camp. Here’s a post about that BLM area on Ghost Town Road in Congress. Sadly, you may be right, Dawn. The one time she seems really confident and worry-free is when leading us home. She seems like such a unique little personality….i almost mentioned in my last post how she seems confident, proud and happy when she finds a different trail home….she is just so sweet and Spike is so funny….i love them both by osmosis…. Beautiful front yard indeed. Nice to have grass for their paws and potty runs. Poor Spike…you can see in the picture that he really wanted to soak in the pond. Watch him…he might choose the trough. Eeeewww…but you know how he is! The horses just might surprise you and show up. Bridget probably remembers the last time she chased a critter her leg hurt for a long time. Great pictures of Spike guarding the chicken on the grill. The chicken looks delicious. If the water trough were lower, Spike would’ve jumped in. He’s going to love it when we get back to camping along rivers and lakes. Hey, that may be why Bridget isn’t chasing critters any more. Hope your weather is getting better in NY. I remember the horses from last year, I can understand why you are looking for them again. Supposed to cool down a little bit next week. This up and down weather has been strange but at least it is not snowing again! I was wondering if you have gone up the hill to Yarnelll? When it is hot on the desert floor,it can be very refreshing there. Beautiful ranch country up there. Hope you enjoy your stay at your new site. Snakes are coming out already so tell Spike to watch out. We’ll probably take a ride up to Yarnell one of these days. In the eighties next week. That will be perfect! I AGREE ON SPIKE BEING DISAPPOINTED ABOUT THE POND BEING EMPTY SO HE COULDN’T SOAK. ON ANOTHER NOTE, I THINK I KNOW WHAT HAPPENED TO THE HORSES…. REMEMBER THE SCANDAL IN THE UNITED KINGDOM, SWEDEN,FRANCE AND OTHER EUROPEAN COUNTRIES? I THINK THE HORSES MIGHT HAVE BEEN ROUNDED UP, SENT OVER THERE AND PROCESSED INTO SCHOOL CAFETERIA MEAT LUNCHES. There was an article in AZ newspaper about a rancher from Colorado buying up horses from BLM open range to sell….possibly as horse meat. So sad to see wild horses rounded up to be slaughtered. There is a horse slaughter house that just opened in Roswell NM that already has a large pen of horses waiting to be killed and butchered. The owner claims the meat will all go to Europe. I hate the idea of it. Only a few states have laws that prohibit the slaughter of horses It’s legal in AZ but outlawed in Calif. I hope your horses are safe there Sue. Let’s think positive. I suspect these horses belong to a ranch up the road near Congress. The BLM land we are on is leased. That’s why cattle graze here, too. Hi, Jim . . . Yes, let’s think positive about the herd of horses I photographed. One thing that remains . . . Every day huge numbers of horses, cows, and hogs are slaughtered in this country to feed our appetites and the appetites of our pets. We care more about horses because of their grace and beauty, the roles they’ve played in our history and in our daily lives, and the relationships we develop with them. However, hogs and cattle are no lesser creatures. Not directing this rant at you, Jim. Feed lots and slaughterhouses make me sick at heart. For some reason, I’m not bothered so much by the slaughter of poultry. Hence, the grill covered with chicken breasts! Or crammed in a stinkin’ feed lot waiting to be slaughtered. I wish my beagle dog were a little less interested in wildlife. One glimpse of a furry creature & he’s off & running!! Fortunately, he’s getting older & tires a little more quickly. I love beagles, but they do take off after wildlife. 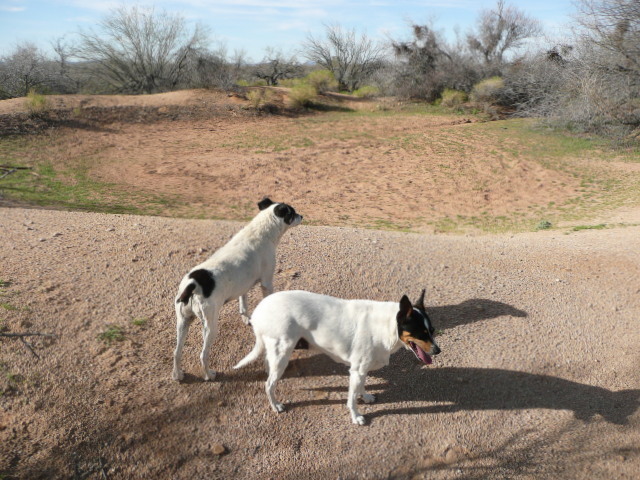 Rat terriers would rather stare at a rodent for 20 minutes waiting for the most opportune moment to pounce. That’s where Spike gets that intense stare at the chicken on the grill! Well… if any of those chicken bits had made a move… Spike would have been immediately on their case!! We were in your neck of the woods this time last year. Beautiful photos. I’m a techy dunce. Does your antenna receive both internet and TV? I only see one antenna on your Casita. Yes, watch out for those rattle snakes. We get our two goldens rattle snake vaccinations for our desert wanderings. That’s a good question. I have two antennas. The Wilson antenna on the pole is for internet. The television antenna is built in the wall of the BLT as part of the entertainment option from the factory. I appreciate your concern about snakes. The crew and I will be careful. That’s why I like this open, grassy area we’re in, rather than a rocky place… less snaky. sue, your new location is heaven! Beautifully greened and empty. Hope the horses show up, that would be a treat. Enjoy! I’m still looking for the horses. Maybe they’ll find us when we least expect them. Hi, Sue! Sheila and I were camped at Saddle Mountain the day you left; loved it! We went onto the first road and found a spot right at the base, as high as we could go. It was amazing, such a beautiful place. We were planning on staying there at least a week..then our MIFI went out, grr. Had to drive all the way to Lake Havasu City to order another one, will be here next week sometime….camping out on the BLM site past the airport. Wow, such beauty, and quiet too. . Hope you are enjoying Congress, looks gorgeous. I finished my solar install. It is so efficient that with only two golf cart batteries we are barely using 15% of our available power daily, and I’m not having to tilt the panels! Wishing you well..
Saddle Mountain boondocking is great. I may have seen your camper off in the distance. I don’t go close to mountains because I fear I won’t get internet signal or we’ll be in shadow. Sounds like you found a good spot anyway. Congratulations on the solar! I quit tilting my panel, too. . . a sure sign of spring for boondockers. Hey Sue! Love the Congress digs and I’m sure the green-green-grass makes it feel more like home! Well, New Mexico is finally acting like New Mexico! Warm weather and sunshine . . .
I’m not sure of my travel plans yet. I’ll probably see more of Utah and camp by water whenever I can. Beautiful camp site you got there. Bet you’ll enjoy those trees and a little grass, or what passes for grass around these parts…lol. Congress is nice this time of year but I’ve never camped there. It was 90 degrees here yesterday supposed to “cool” down over the next few days. Might even get down to normal in the 70’s in a few days. Hope you get to see the horses. If it’s green and on the ground I call it grass. Yes, this is a nice camp. I think this next week is in the eighties, but I don’t doubt another cold “snap” will occur. Remember the old bumper sticker — Think Snow? Now I need everyone to Think Horses! 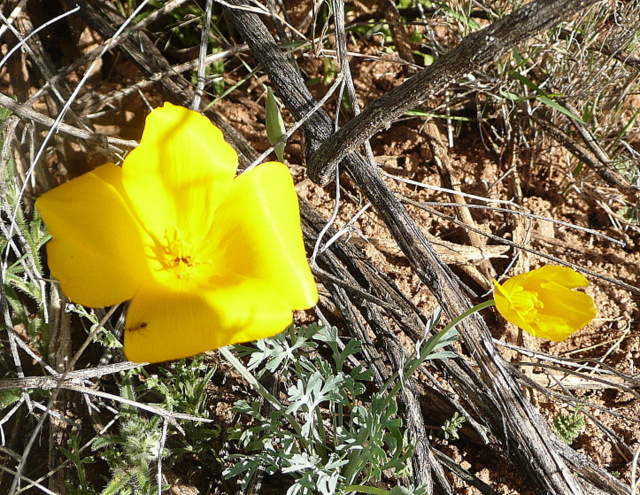 I’ll bet the ocotillo and cactus will be blooming soon as well as the little desert wildflowers. Enjoy. 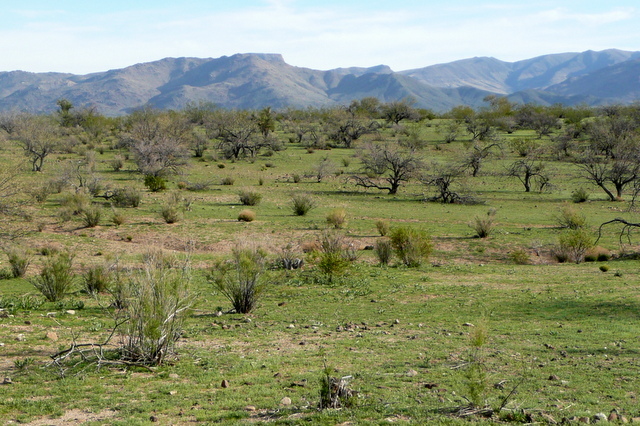 Not much cactus on this land, maybe because it’s grazed by livestock a lot. I’ve seen only one ocotillo here. It’s mostly mesquite trees and palo verde. The brittlebush with its pretty globe of yellow blooms are nowhere to be found. Lots of different rocks of various colors though . . . and that’s what’s really important, right? Yep, rocks are really important IMHO. Those palo verde can be beautiful when blooming so hope they bloom soon. I’m not a fan of mesquite trees, been cleaning the dead wood out of my mom’s ones here and gotten stabbed a few two many times. Hi Bob . . . Was the link so I’d see the ad for dog bad breath or so I’d hear Willie Nelson sing “On the Road Again?” 🙂 Either way, I appreciate you thinking of us! I’m getting tired of that danged dog breath ad!! Kate from Oklahoma here. I am currently “glamping” with 78 other Independent type Gals from the Women’s camping group, in Glen Rose Tx. Beautiful park and not too pricey. During dinner conversation last night, the subject of bears in Northern New Mexico came up. A park owner there puts moth balls in every RV’s refrigerator vent so the bears wouldn’t come around. I thought I would let you know, since you were in bear country last summer, and might be again this summer. Seventy-nine of you? Wow! I’m happy for all of you . . . Moth balls, eh? Thank you for the hint . . . very thoughtful of you to pass it on to us here. Enjoy your beautiful camp, Kate! Mothballs are flammable and do not belong in refrigerator vents. None of the interior of the ref is vented out so the mothballs are just a nonessential hazzard for fire. The small flame of your ref can ignite the moth ball fumes if conditions go bad. Good to know. Thanks, Barney. I love a green yard! Yours is beautiful. I am praying for the horses. The Lord is an animal lover also and He cares about them. Glad you are happy in your new campsite. Hi Pauline . . . Hope all is well and happy at your house . . . Love you, too! I sure like seeing all that green meaning spring has sprung there. Will be back Thursday afternoon. Sure hope to see you again. And, hope you see the horses. I’ve been honored to have you visit my blog and to comment even though you are far away in South Africa. I know you will make the most of your last days there. Maybe we’ll see each other when you get back home. I am enjoying your new yard Sue. Hi to those little furry kids too. PS I can tell Spike likes Chicken. Also those cattle water troughs are refreshing on a hot day if you don’t use soap when ya splash around in ’em. When I was a kid, I did it frequently. When I first came to the desert, I was warned about the cholla plant and how painful it is for dogs who tangle with it. Bridget and Spike learned very quickly to stay away from it. My hope is that they will instinctively retreat if a rattlesnake presents itself. Keeping them leashed or penned up all the time severely restricts their lives. I want them to be dogs, not puppets on a string. Yes, it’s a risk. I appreciate your concern, Jim. Thanks for the link. Hi, GG . . . Welcome to my blog! Washington is on my go-to list. I do appreciate the dryness of the desert. There’s been a lot of fuss locally about how warm it is this early in spring (in the 90s). Having lived many years in high humidity, this warm and dry weather suits me perfectly! Nice to hear from you . . .
I’m in Lake Elsinore, CA. I bought a Tioga RV yesterday to fulltime with my two dogs. I hope to get to the desert before it is toooo hot. Love your blog, I have read it from the beginning, that took awhile. You are a big inspiration. Your pictures are beautiful and I really appreciate you shareing your budget. I’m hoping to live less and enjoy life more. You’re welcome, and congratulations, Linda! How exciting for you . . . I wish you and your canine crew many safe miles, exciting adventures, and beautiful, peaceful camps in your new home-on-wheels. Thank you for the compliments. I never tire of hearing that someone loves my blog. Best wishes, fellow full-timer! I love the green…we are in the back and forth weather stage…warm a couple days…cold front comes through. I read todays post, and suddenly have a craving for grilled chicken. Keep writing and stay safe. Hi, Tia! North Caroline in spring is lovely, whether in the mountains, the seashore, or somewhere in between. Hi Sue, I know you like to be fairly loose in your destination planning, but do you have any thoughts about the general direction you’re heading in this summer? Don’t know if you have ever been to Michigan, but the west coast is breathtakingly beautiful and the UP is a really special place. I won’t be going to Michigan this year. My general direction will be Wyoming, Montana… maybe as far as Washington. Thanks for the idea for future travel!